Fall and winter will be your pup's favorite seasons when they get to wear this comfortable Combed Cotton Snowflakes and Hearts Dog Sweater by Doggie Design in Pink! Looking for a classic style that's warm and cozy? 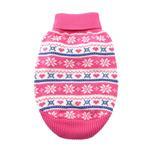 If this cheery pink Snowflake and Hearts Dog Sweater doesn’t make you want to cuddle up with your pup by the fire this Fall season, we aren’t sure what would. 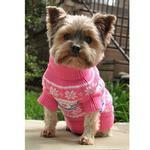 Snowflake and Hearts Dog Sweater by Doggie Design - Pink Customer Photos - Send us your photo! Lilly is really funny because she gets incredibly excited whenever I bring out any of her clothes. Her wardrobe is growing to the point where she needs her own closet. Sammie just loves modeling her BaxterBoo sweaters! I think she looks very pretty in pink. Sassi Sue is adorable in this beautiful sweater. Can't stop looking at her. It's soft and fluffy. Posted On 02/04/19 by Carolyn M from Tucson, AZ Yes, Carolyn M recommends this product! 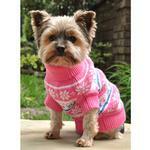 Doggie Design has the highest quality clothing ever! The sweaters are so soft & cozy. They wash beautifully, too. Posted On 01/20/19 by kathleen w from Old Saybrook, CT Yes, kathleen w recommends this product! I bought this for my grand dog. It fits great and she looks so cute. It is heavy for the cold weather in New Hampshire. Thanks BaxterBoo! This little sweater is perfect for my 2 lb Maltese Tootie, good for everyday wear around the house to keep warm in. Love this soft cotton, Snowflake & Hearts sweater & ordered a size-up as it is cotton. Posted On 11/27/18 by Angela F from Madison, CT Yes, Angela F recommends this product! Another great sweater! I have purchased a few sweaters for my German Shepherd, Sammie, and this one is as beautifully made and adorable as the others. I'm never disappointed. Minerva loves wearing the clothes she gets from Baxter Boo. She has been dog of the day and likes her picture to be on your site. We tell everyone that we get all he clothes from Baxter Boo.